Sometimes I find myself making so many notes while I am reading a novel that I then know I need to blog about it. This is true for Weike Wang’s debut novel, Chemistry, published in May 2017. I learned about this novel from the CBC Spring Book Preview 2017 which seems enriched for Canadian authors but Chemistry is not one of them. 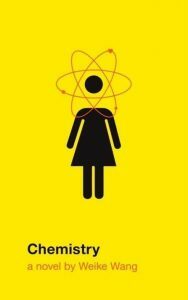 The synopsis from Knopf that I read at the CBC website was enough for me to place a hold on it from the library: a Chinese-American chemistry grad student is at a crossroads regarding her career in grad school and a boyfriend who has proposed to her has to make decisions that affect her entire life…. The narrator is unnamed but we know she is Chinese-American, arrived in the U.S. as a child. Only the boyfriend is named. There is also the best friend, the math student, the other student, the lab mate, the counsellor. Ethnicities aren’t given either except of course Eric is not Chinese. And the best friend, a doctor in New York not that far away from the author in Boston, might be Chinese. I suppose the narrator’s world could be quite small, in that there is only one lab mate she really socializes with, one best friend. I’ll admit, the random thoughts aggravated me at first. The narrator seemed weird, very weird. Neurotic. Possibly autistic (and there’s nothing wrong with that). Some of the reactions she described having seemed erratic and unpredictable. Maybe she is a quintessential geek. On top of that, she was either unemotional or paralyzed by emotions from her own demons. Eric seemed to know her and accept her quirks but there’s a limit to her not seeming to reciprocate which he finally reached. When he leaves, she seems needy at first, calling him often. It is not so the narrator could express to him love or regret, but reacting to the change in her life caused by him moving out. But when he reaches out to her finally and she didn’t respond, with some bargaining to herself, like the following, I didn’t understand it. She doesn’t deserve him! “But I’m not going to open it, I say. At least not until tomorrow. Then tomorrow comes and I decide not to open it until the day after. If I catch three green lights in a row, I will write him back today. Through the seemingly random thoughts and facts, she is sorting things out. She draws upon memories and anecdotes of her parents’ relationship, how her mother gave up her life in China to be with her husband who had an educational opportunity in Ohio. Growing up, the narrator has a strong sense that her mother is very unhappy with her lot in life, how restricted she is in America. Her mother has certain expectations in her daughter but the father is a tiger dad regarding education, constantly quizzing the narrator and creating brain-teasing games. On the grad student front, she is not progressing. She has not made the leap from technician to scientist that a researcher needs to make, that she’s seen Eric make. They both love chemistry but he tangibly has taken the next step. He graduates and accepts a position in a different city. She has a breakdown in the lab, leaves the program and tutors to make ends meet. As a tutor, she displays her extensive scientific knowledge and this could be inspiring to students who want to see abstract scientific principles at play in the real world. She could be an inspiring teacher with some discipline and a lesson plan. She gets along very well with her math student. She makes observations about language. English is a second language for her and although she has basically mastered it, some quirks are beyond her and in conversations with Eric, she is bewildered by the idiosyncrasies. Her mother is not fluent in English and taught he Chinese and she dwells on quirks in that language as well. It is also a novel about mothers raising daughters and their complicated relationship. Her best friend has a daughter, newborn at the beginning of the novel and they wrangle the child together when she visits them in New York. That’s why I think her best friend is also Chinese, they mull a little over how to raise the next generation. Meanwhile, she comes to a realization about her own mother, their relationship. “Why do you defend her? the shrink asks. She doesn’t deserve this kind of loyalty. Because mothers have parents too? Because they have lives beyond their own children? Because I still want her to be happy. Many times, she lifted up my chin and said, You must be better than the man you marry. You must succeed beyond him. She manages to pinpoint that she cannot marry if she’s not set in her career. Leaving grad school upended a path she thought she was on and tutoring is not a permanent state. I don’t want to get married until I have done more for myself. But also I owe it to them to do more for myself, which is what Eric didn’t understand; he said, You shouldn’t owe them anything. We argue over this. The American brings up the individual. The Chinese brings up xiao shun. When I ask Eric if he thinks a child can ever feel entirely independent of her parents, he says, What kind of question is that? But now I don’t really know. There is too much already shared. And then for the title of the novel, chemistry. Does she have chemistry with her boyfriend? They share a love of chemistry. And on first glance, she seems prickly, stand-offish. Could they possibly have a particular brand of chemistry that isn’t Hollywood Movie Chemistry? With the seeming naivete of a child or the insight of a savant, she observes and internalizes her experience of other people’s marriage. Her parents fought terribly and the love seems gone, replaced with resentment. But they need and respect each other and ultimately work as a team on home renos. Her best friend’s husband cheat on her after the baby is born and they undergo a trial separation followed by counselling. The best friend notes he’s good to her and the baby and through counselling remembers what she loves about him. These are imperfect relationships that are reflective of real life. Two years pass in the novel although it’s hard to really track it (except that her best friend’s daughter has acquired a lot of skills each time we see her again) and at the end, she tentatively reaches out to Eric to give it a try again.